Question: To enable a better understanding between the cultures, what do you think of holding a cultural event, where each of the cultures is highlighted – including the German culture. I pointed out that Dr. Zenker of the Ausländerbeirat has said that the committee will not be arranging festivals anymore. And we also have smaller cultural events such as the international village at the fountain festival and Worldfest at FIS. But what about one large festival, which includes German culture as well? We have done that in the past and I think it is a good thing. It does not necessarily have to have a “multiculti” feel to it, but it is good of course to have culinary specialities, culture, music and dance. That does make such events attractive. It was stopped a number of years ago because fewer people came, and many already knew these things. 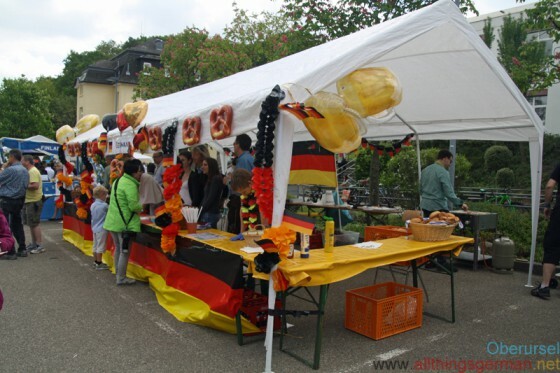 There are already a whole range of international cultural events, hosted by the Windrose charity, the Chinese Consulate, there was the Vietnamese summer festival, and the family day for Koreans in the region was held in Oberursel as well. Then there are other events, such as the Chopin concerts. These are also a much-loved place for people of different nationalities to meet. But I think we could organise something, such as an open day at the town hall. We would have to make sure, that it replaces something else, because the number of festivals in the summer months here is exorbitantly high and many don’t get noticed. By the way, we had such a festival in the Adenaueralle the year after the Hessentag. But after that the financial means for it were cancelled by the local politicians. I would advocate holding such a festival of cultures and religions in the middle of the town. A lot of German people would come as well a lot of new contacts would be made. That is our aim. There were cultural festivals in the past, where foreign cultures were presented. My personal impression was, that these were more of token gesture. I would find it more exiting to look at where integration is taking place. This brings me back to my club that I am active in. We have singers with migration backgrounds who we have come to us through personal contacts. There are well integrated by taking part in the choir rehearsals and concerts. So we should be asking ourselves, how we can get the new residents into the clubs and societies, so that integration can succeed. In particular I’m thinking the youth groups and the youth sections of the the clubs. It’s perfectly natural for all children to play sport together, to play football, sing, make things, or whatever. I find that this is the best form of integration. A fine example was on Corpus Christi at one of the church fêtes. One group, who were looking after the asylum seekers, had gone and collected them and brought them to the fête. I think that is much better than holding a artificial festival. They were right in the middle of things and the children managed to integrate themselves the fastest. They were playing games, and the children have no reservation and just do something together. The children often help to break the ice and get their parents talking to each other.